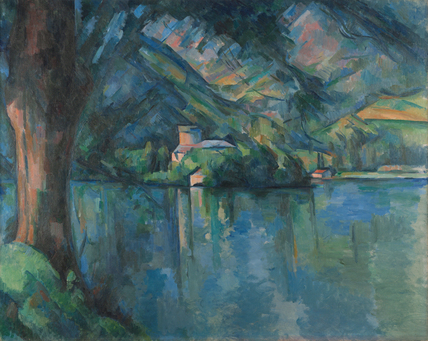 Cézanne described this mountain lake near the French border with Switzerland as a scene one might expect to find in ‘the albums of young lady travellers’. Instead of recording the standard picturesque view, Cézanne set out to explore the landscape in terms of patterns of form and colour. The tree in the foreground gives a sense of scale and distance to the castle on the far banks of the lake. The slopes of the mountains close off the scene.